It’s fair to say that 2012 is setting its own agenda. Measuring it against the one I set in January, I find that the first half of the first quarter was very much on track. I built my library! 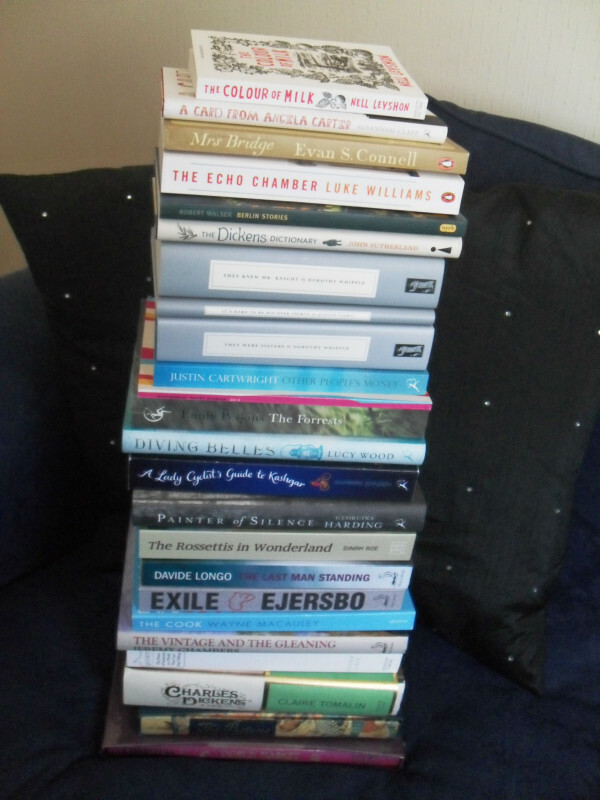 I stuck to the TBR dare, made no purchases and read some cracking books, of which Oscar and Lucinda was the highlight. Then came a surprise invitation from Bloomsbury, which I was delighted to accept and turned into a 3 day publisher-visiting, Dickensian site-seeing book-acquiring expedition – the fruits of which can be seen right. It also signalled the end of the TBR dare at 6 weeks, because I wanted to read this while in London. Plans to learn to teach English as a foreign language were put on hold when my employer decided that the time was right to introduce PRINCE2. So for two whole weeks I read the 342-page Prince2 manual twice – though you won’t find it on this blog’s reading list. It’s dry and tough as old boots but I persevered. I was determined to find some literariness in it and was rewarded when I spotted the sole metaphor! The plan is the backbone …. All that attention to detail paid off and I passed the practitioner exam. But I almost had a meltdown – it’s been a long time since I experienced exam conditions and I shall think long and hard before submitting myself willingly to that experience again. Blogwise I’ve never caught up with myself, though I have still have some posts from February that I want to write – nay, that I will write. I enjoyed February in Venice and a Falladian February too much to pass them by without record. Which brings us to March and, following a couple of outings to Glasgow’s AyeWrite! festival, my modest 2 posts per week blogging routine began to re-establish itself. Though not for long. I now find myself preoccupied with another piece of unscheduled non-fiction – The Heart Manual (Post-Myocardial Infarction edition). Rossetti is poorly though making a good recovery. While he does, I have no intention of putting the blog on hold – it’s the best distraction therapy I know. It has, in fact, helped me through some extremely rough patches in recent times. At the beginning of the year I predicted that I was going to be off-blog busy and that I would need to limit myself to one post per week. And so it has proved and will continue to be though not quite for the reasons foreseen. Let’s hope the 2nd quarter of 2012 proves to be a less complex affair. I can imagine the potential breakdown I may have if I were asked to do PRINCE2!! Well done for passing the exam. Hope 2nd quarter is a simple one!